In the digital world, the need to protect communications increases every day. While traditional digital encryption methods are useful, there are many other options for hiding your information. Information Hiding in Speech Signals for Secure Communication provides a number of methods to hide secret speech information using a variety of digital speech coding standards. 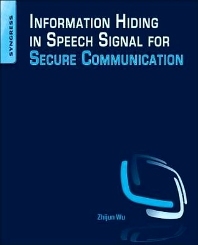 Professor Zhijun Wu has conducted years of research in the field of speech information hiding, and brings his state-of-the-art techniques to readers of this book, including a mathematical model for information hiding, the core concepts of secure speech communication, the ABS-based information hiding algorithm, and much more. This book shows how to implement a secure speech communication system, including applications to various network security states. Readers will find information hiding algorithms and techniques (embedding and extracting) that are capable of withstanding the advanced forms of attack. The book presents concepts and applications for all of the most widely used speech coding standards, including G.711, G.721, G.728, G.729 and GSM, along with corresponding hiding and extraction algorithms. Readers will also learn how to use a speech covert communication system over an IP network as well as a speech secure communication system applied in PSTN. Presents information hiding theory and the mathematical model used for information hiding in speech. Provides a number of methods to hide secret speech information using the most common digital speech coding standards. A combination of practice and theory enables programmers and system designers not only to implement tried and true encryption procedures, but also to consider probable future developments in their designs. People whose profession is information security. Readers may be scientists and researchers, lecturers and tutors, academic and corporate libraries, practitioners and professionals, and even postgraduate and undergraduate students. Professor Zhijun Wu achieved his post-doctoral work of Information security in July 2005 at Tsinghua University. He is currently a professor and doctoral tutor in the Civil Aviation University of China, and he is an expert of network information security in The Chinese Institute of Electronics. His research interests are in the field of networking and information security, and security protocol analysis and design.